What we have here are two door bag platforms with an integrated kneepad using a unique Molle pouch accessory system. Each kit or naked platform is sold in pairs for the driver and passenger doors. The $85 naked or $165 complete four-pouch kit compares to its competition from PRP ($65) and Pro Armor ($95) very well, but neither of those products are customizable like the Bombshell product. 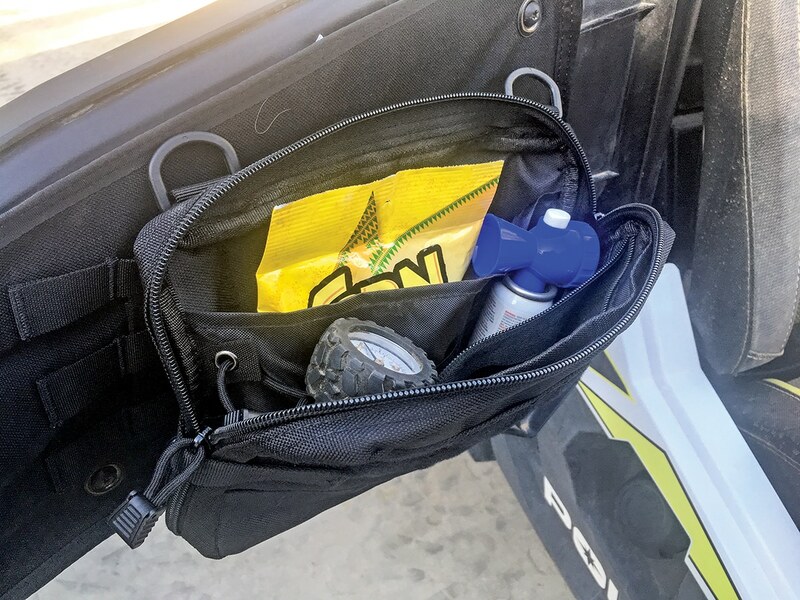 An endless array of pouches, bags and holsters can be installed wherever it works for your situation. All of the bags are universal, but some are intended for items like cell phones, cameras, first-aid kits and even handguns. The pouches attach with Molle straps, which is a method developed by the military. It’s basically a strong nylon-strap looping system. 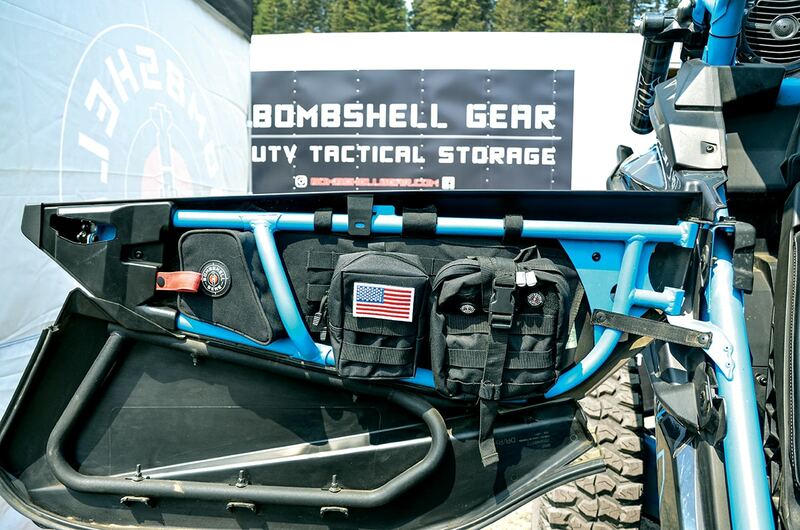 Look at any U.S. Military-issued vest, backpack or vehicle and you will see the Molle system used. On the RZR, you simply unscrew the plastic door skin and mount the pad base on the inside of the door frame using those screws. The base of the door product includes the kneepad and is made of 1000-denier-coated Cordura nylon. Next to the kneepad is a flat surface with three rows of PALS, which are the loops that the bags hang onto. The entire product is built to military spec for quality, ease of use and super-quick deployment. On the RZR, installation was quick and simple. Basically, all you have to do is remove the four screws that hold the stock door skin on and hold the door bag up to the frame, then reinstall the screws. For aftermarket doors, you would want to pick up some electrical loop straps and/or just bolt the pad base directly to the door. On the Can-Am X3, the pad base installs with Velcro straps over the stock tube door frame. Basically, after the install, you figure out where each bag works for your situation. On the driver’s side, the larger one holds our mini air compressor and the smaller bag carries our tire plugs. Bombshell has five pouch options to choose from. Four pouches come with each two-door kit. Anyone who is looking at other door bag products or just wants to add the kneepad. If you haven’t used a door bag, you don’t know what you are missing out on. 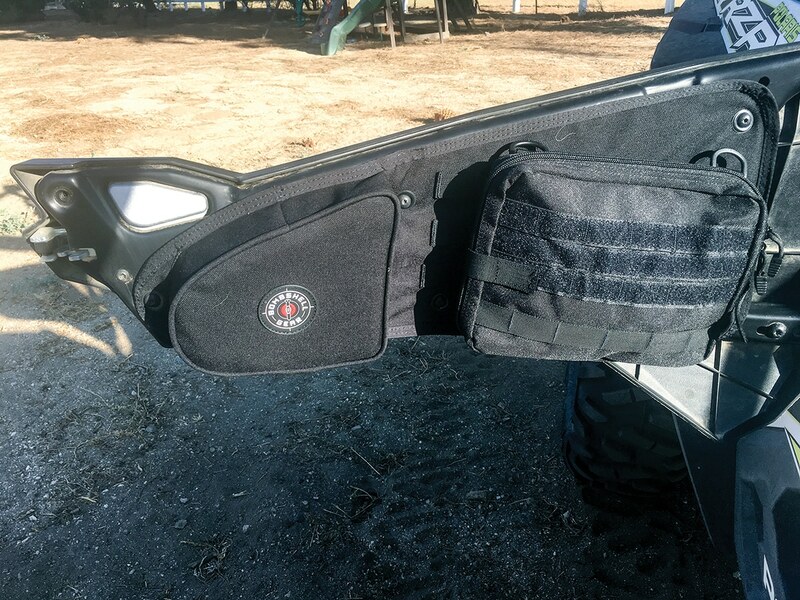 Door bags are the most convenient way to carry small items for quick access in your UTV. Almost every owner wants to add a custom look and feel to his or her UTV. The Bombshell helps you do that on the interior.